Interlude TTDI, located along the same row as Sid’s and the infamous Duke and Duchess, is a popular watering hole of the folks in that area, especially on weekends. But what many don’t know, is probably the fact that while Interlude is a bar that serves pretty decent cocktails, it serves a praiseworthy slew of tapas as well. And after sampling the food last Sunday, we were gobsmacked. We have to say, that it’s is pretty unusual for a bar, or any bar for that matter, to have such a strong menu to complement it, but we think this is a huge plus point for Interlude. Both cocktails were perfectly balanced and not too sweet at all. We were surprised by how subtle they were. The Martini was blissfully light with a great aftertaste of chocolate, laced with that characteristic orangey flavour of cointreau. The Green Winter could have been a health drink, save for the alcohol. It was that good. Explosive cucumber aromas will hit your palate before intoxicating your senses with green chlorophyllic notes. We told them they should rename the cocktail, Green Summer or Green House, because ‘winter’ just sounded too dismal for such a great and refreshing cocktail! Apparently, Interlude has changed the menu 5 times since opening in 2013 – most of what’s on the menu is selected to showcase the use of local ingredients and the chefs try to only use imported products where necessary. The menu at Interlude is the brainchild of a Malaysian chef who recently returned to KL after working for many years in Melbourne. Talking to him we found him to be a charismatic, fellow foodie who was both passionate about food, as well as the business. He soon recommended some dishes for us to try, and we settled into dinner. 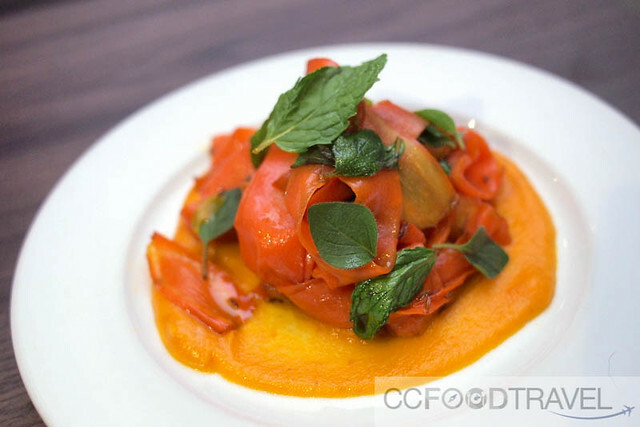 Spiced carrot ‘pappardelle’ with oregano & mint.. such vivid colors on a plate! 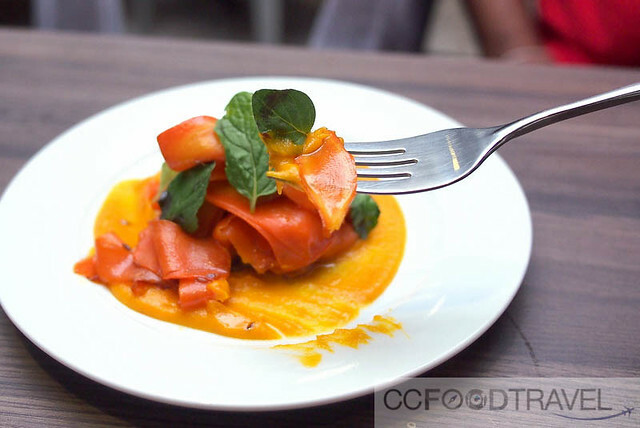 Carrots that are sliced to form the characteristic shape of the pappardelle pasta were just too good for words. 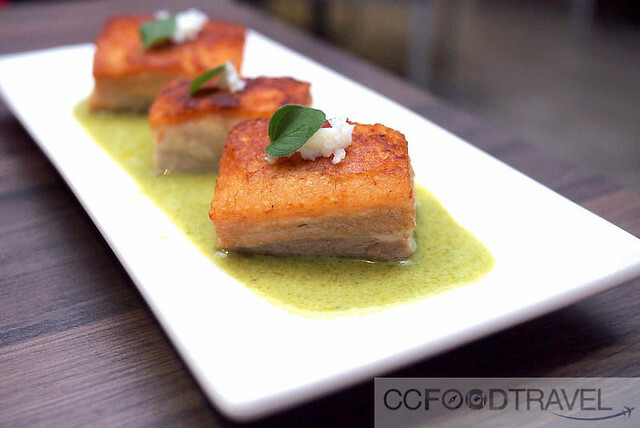 Crunchy, yet smooth and slippery, this was the perfect textural balance to the sweet puree. The mint leaves and spice, elevated its flavour further. Not a bad vegan dish at all. 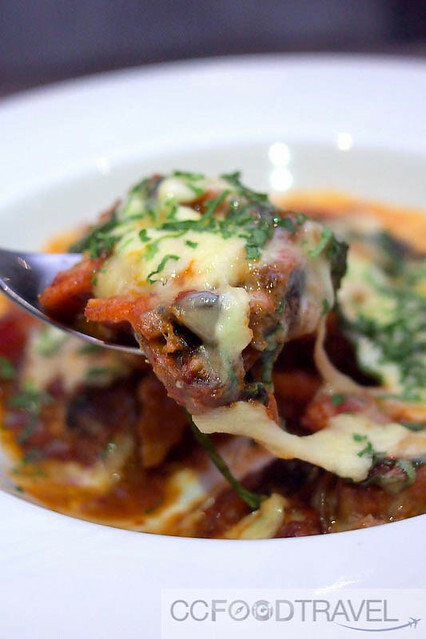 If all vegetable dishes tasted this good, I’d probably have no qualms giving up meat whatsoever. 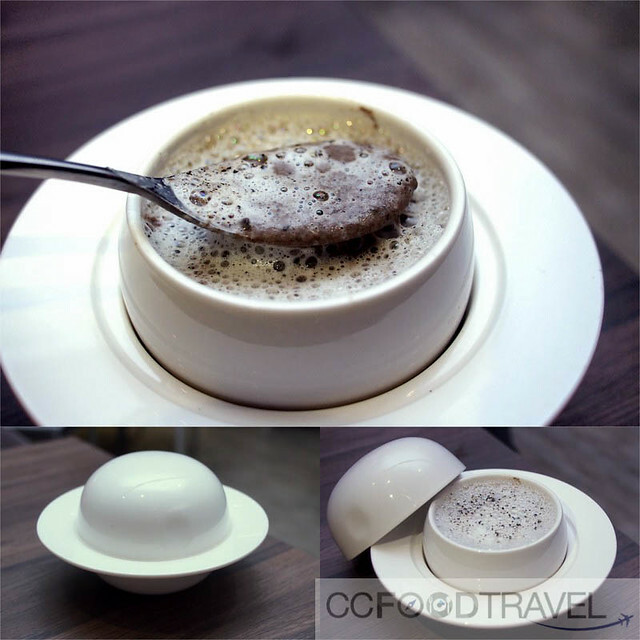 Mushroom soup – very salty but full of mushroom flavour. This soup was bordering on being too thick and creamy. Roasted vegetable tart – This incredibly tasty dish of roasted seasonal vegetables cooked in homemade tomato sauce and baked in cheese was rich and cheesy. Real comfort food. 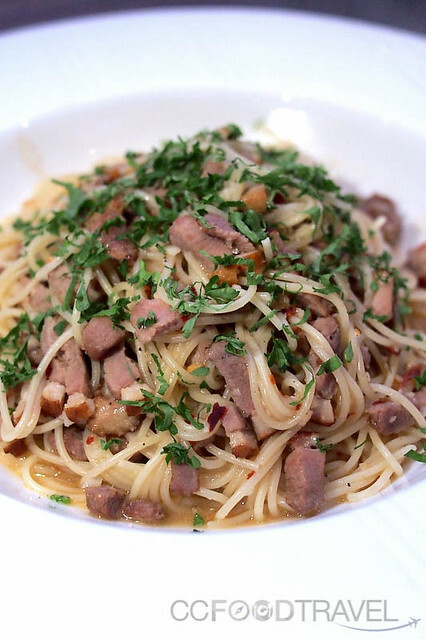 Cured Duck Spaghetti – this cappelini was overcooked. Would have preferred it done al dente. And what the earlier soup had too much of, this one was lacking in salt! 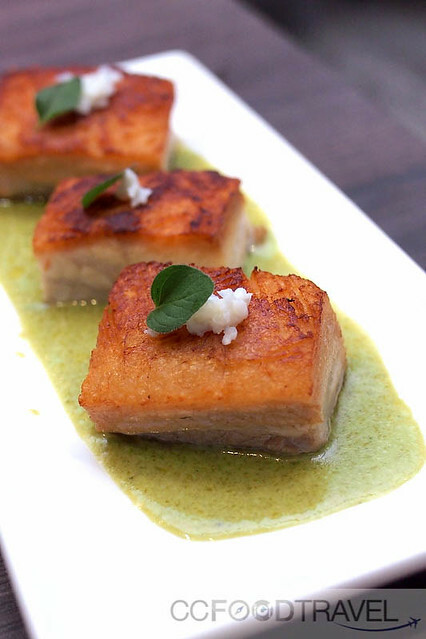 This was the best dish on the menu.. Chunky, seventeen-hour slow-cooked pork belly served with an amazingly delectable Chervil, Parsley chicken stock sauce. The unctuousness of the pork belly.. the rendered fat and the super crispy crackling, sealed off with succulent pork meat was just gobsmackingly good. 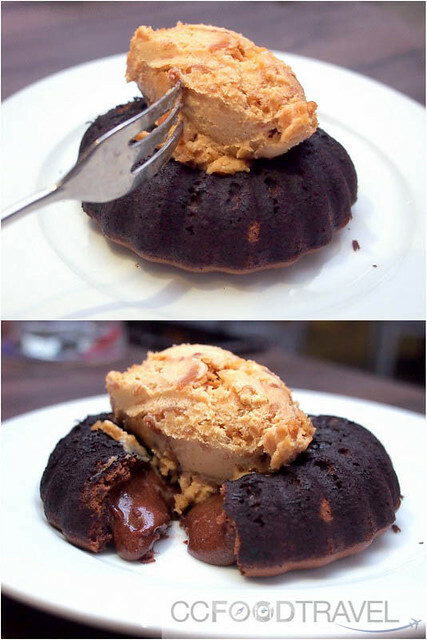 A must order at Interlude. 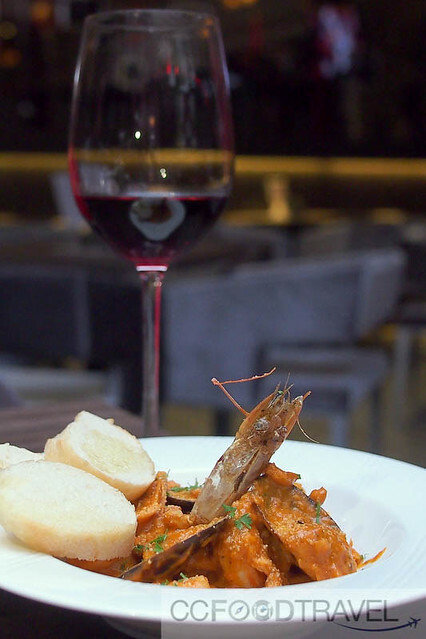 Frutti de Mare – a platter of seafood simmered in homemade tomato sauce. Not the best seafood we have tasted, as the fish was overcooked. 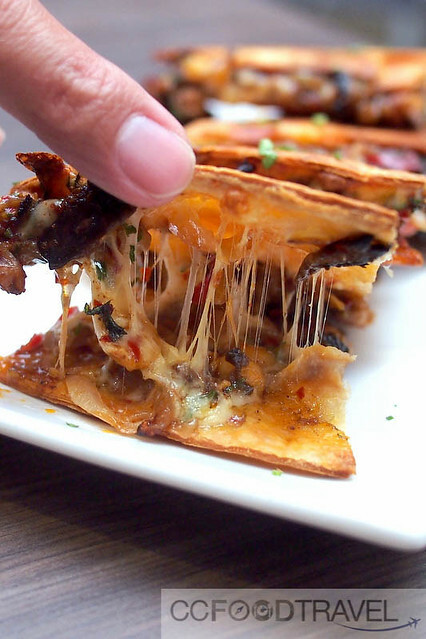 Piping hot Quesadillas! Super addictive.. these Mexican-style stuffed pancakes, toasted like sandwiches, made with two tortillas sandwiched together meat, capsicum and a cheese-based filling, made for a fabulous snack. Can just imagine how good this would go with beer. 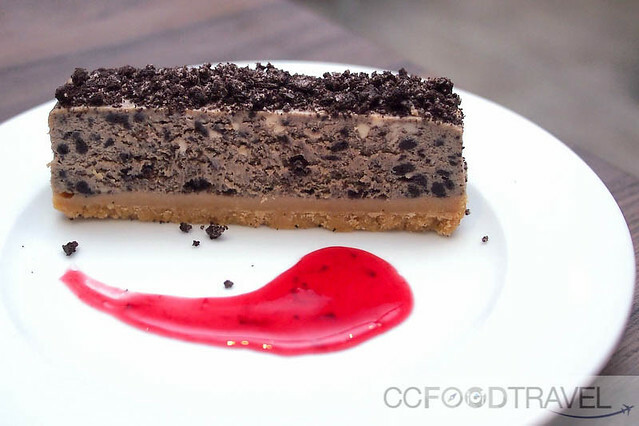 Oreo cheesecake – too thick & stodgy for our liking. Super sweet of course. Chocolate Lava cake.. loved the old school crusty looking cake with a thick, gooey heart of chocolate lava.. it really did it’s ‘thing’ flowing out. And the homemade peanut butter ice-cream while super stodgy, probably meant, it had tons of actual peanut butter in it. 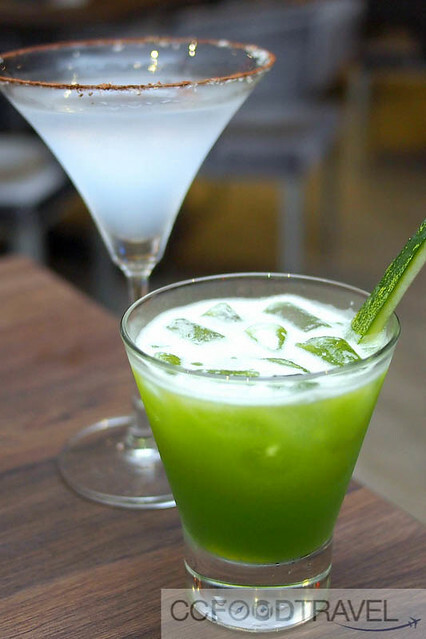 Interlude is the place to visit in TTDI for great cocktails and delectable tapas to boot!